This small park consists of 16 apartments and is beautifully situated on a hill in Parghelia near Tropea. The apartments and the beautiful pool are beautifully situated with breathtaking views. 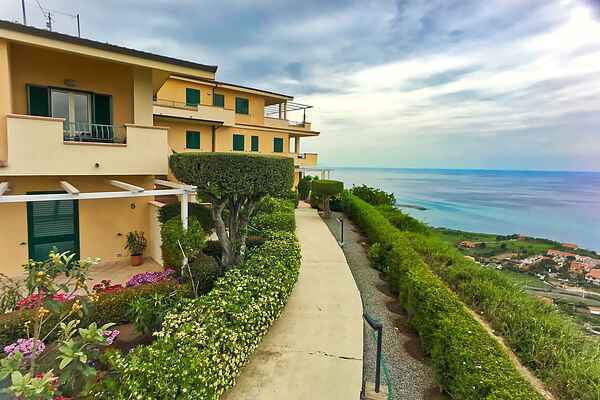 The house is near the sea with white sandy beaches, shops, restaurants and the tourist port of Tropea. From the living room and dining area of apartment Lunedì you look out over the Tyrrhenian sea. The gates of the residence can be remotely controlled and offer privacy and security. The park has a private parking space. There is a park manager present who takes care of maintenance and supervision and he only speaks Italian. Parghelia is close to Tropea, Drapia, Zaccanopoli and Zambrone. In the summer you can visit the local festivals (sagre) and try the typical specialties, including the ' nduja "and" Cipolla Rossa from Tropea. From the harbor you can go to the Aeolian Islands, take a boat and visit Stromboli, Lipari and Vulcano.